In June 1986 the popular Australian television show Hey Hey It’s Saturday launched a home movie competition it cheekily named The Canned Film Festival. 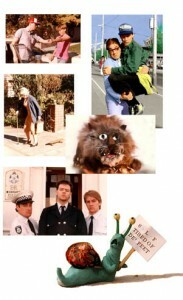 Daryl Somers and producer Jim Burnett were inundated with entries totaling around 600. They estimated that approximately 60 percent of these films had been made before the competition was announced. THE SKATEBOARD SAGA was in the other 40 percent. When Kewley and a good friend heard about the competition they put everything else aside and focused on creating a film that they thought would be well suited to the Hey Hey It’s Saturday audience. Deciding that the film needed to be a highly visual, almost slapstick comedy with a mixture of as many different production techniques, they chose to create a short film that utilised live action, animation, claymation, models, puppets, stunts and more! Ideas for a ‘chase film’ were thrown about and THE SKATEBOARD SAGA was born. Shot on super 8mm film, it was made for a total cash outlay of approximately $300AUS. 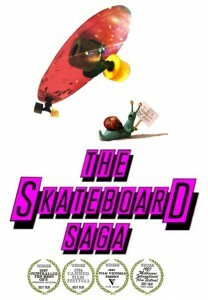 The first cut ran approximately 6 minutes but the competition called for a 3-minute film – so THE SKATEBOARD SAGA was judicially edited for TV, while a copy of the original full length ‘director’s’ cut was retained. In December 1986 – on live television – THE SKATEBOARD SAGA was named the Winner of the Canned Film Festival! It was the cataly st for Kewley and his friend to form a production company where Kewley stepped into the role of Producer of television commercials. It was a very exciting time and they were very grateful to Hey Hey it’s Saturday for the opportunity. Addendum: The opening title of the film is shown being hand written in chalk, but does not get beyond ‘The…’ before the chalk breaks. Essentially the film’s first joke, the film’s title was simply The…! But the producers of Hey Hey insisted that it have a more formal title and minutes before it was to go to air they informed Kewley & Co that they were going to call it The Runaway Skateboard. Feeling that The Runaway Skateboard was a little bland, they came back with the suggestion it be called THE SKATEBOARD SAGA. The name stuck!